A Somerset man has become the first person convicted for breaking the ban on fox hunting with hounds. Tony Wright, 52, denied breaching the Hunting Act, when he led the Exmoor Foxhounds on 29 April last year. But he was fined £500 at Barnstaple Magistrates' Court in a case brought by the League Against Cruel Sports. He was the first fox huntsman to be summoned to court for defying the law which came into force last year in England and Wales. Wright, of Exmoor Kennels, Simonsbath in Somerset, said he would appeal and called the Hunting Act a "stupid and pointless law". He said he had been trying to comply with the law "as I understood it". He said: "I might have been found guilty, but I certainly don't feel like a criminal. "If people were confused by the Hunting Act before today, they will be a lot more confused now." He added: "I was doing my best to follow the rules as they are written down. "I had no idea I was doing anything illegal." The league told the court during a week-long hearing that Wright broke the hunting ban by signalling the Exmoor Foxhounds to pursue two foxes at Drybridge in Devon. Exercising hounds, chasing a scent trail and flushing out foxes to be shot is still legal. 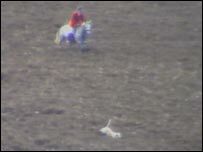 But the league alleged the hunt on 29 April went further than that by allowing hounds a "prolonged period of pursuit" of a fox on two occasions. Prosecutor Richard Furlong said it did "violence to common sense" to argue that Wright and his followers were engaged in a shooting exercise. And he accused Wright of "a cynical attempt to pay lip service to the legislation". Wright said he had stopped the hounds. District Judge Paul Palmer told Wright: "I understand the difficulty that everyone has with the act coming into force." Judge Palmer was shown video evidence by the prosecution. He said: "What I saw was not exempt hunting." The league brought the case at a total cost of more than £100,000 after Avon and Somerset Police declined to take on the case based on the evidence available. The force pledged after the case to change its view on future prosecutions. It said in a statement: "The findings of the court have demonstrated a benchmark for what does constitute a breach of the Hunting Act. "Avon and Somerset and other forces across the country can now learn from this for future standards of prosecution." League spokesman Mike Hobday said: "The case has shown we were right, but we would give the police full credit for accepting so quickly that they can learn from this." 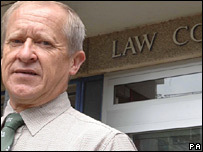 The judge awarded the league £250 towards its costs, but Mr Hobday said the league was not bitter about the expense. He said: "It was very expensive, but very worthwhile. "It was a demonstration to everyone that the Hunting Act is well written, clear legislation." He said the league had been "very comfortable" in taking the private prosecution. "We were clear in our minds that the chasing of the foxes that we saw on video was against the law. "The message to hunts now is that chasing foxes is against the law and if hunts do it they will be brought to justice. "The league will be working with police forces up and down the country so that where hunts do engage in this sort of cruelty they will be prosecuted." How do hunters plan to get round the ban?